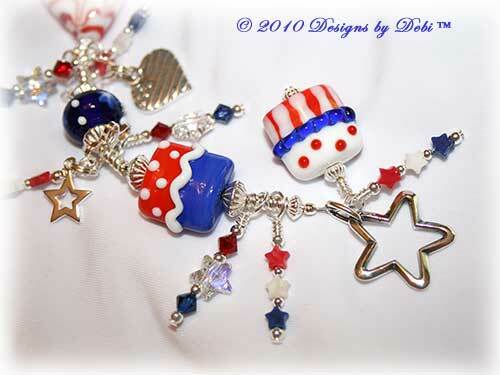 I LOVE flags so in honor of Flag Day on June 14th and just in time for the Fourth of July comes this fun, Patriotic bracelet reminiscent of fireworks on the Fourth of July. I began this piece with some beautiful artisan lampwork beads handmade by Kimberley Nicole Rogalski of Bastille Bleu Lampwork in Milwaukee, Wisconsin. 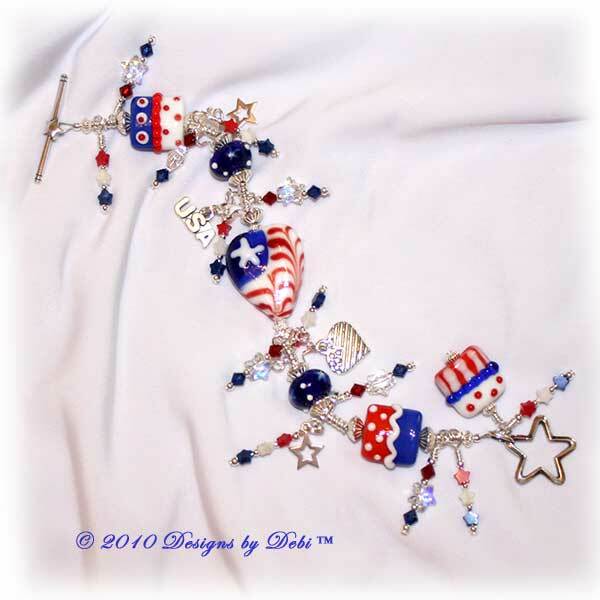 They include a gorgeous variety of beads with stars and stripes in red, white and blue, the center one is a beautiful heart with abstract flag design that I must admit I didn't want to part with! 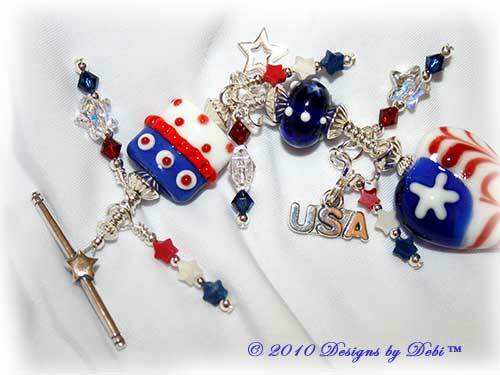 In between the lampwork are sterling silver saucer and tube beads, the perfect stage for my fireworks. To create this effect, I hung dangles from sterling silver star-shaped links. Some of them are red, white and blue howlite stars and the others are Swarovski red and dark sapphire bicones flanking crystal and crystal AB stars. 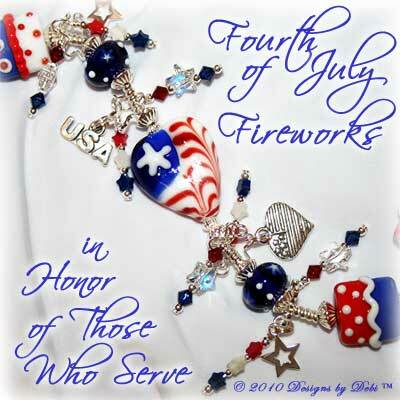 You'll also find four sterling silver charms hanging festively among those fireworks...2 stars, a heart with an embossed flag design and a USA one. Then I finished the bracelet with a sterling silver star toggle clasp. Flag Day is my late grandfather's birthday and he was an Army veteran. So as a tribute to him and all those who serve and have served our country, the charity I've chosen to receive the donation from this month's piece is Soldiers' Angels, one of my personal favorites. Soldiers' Angels was started by Patti Patton-Bader, mother of two American soldiers, after her eldest son deployed to Iraq in 2003 and expressed concern that some soldiers in his unit didn't receive any mail or support from home. Patti contacted some friends and extended family and asked if they would support a soldier or two. Within a few months, Soldiers' Angels went from a mother sending a few extra care packages and letters, to an Internet community with thousands of Angels worldwide. It is now a volunteer-led non-profit with over 200,000 volunteers providing aid and comfort to the men and women of the United States Army, Marines, Navy, Air Force and Coast Guard as well as veterans and their families stationed wherever we raise our nation's flag. The Soldiers' Angels motto is "May No Soldier Go Unloved" and they do their best to make sure none do. Their volunteers have sent hundreds of thousands of care packages and letters to deployed service members. They supply the wounded with First Response Packs directly at the Combat Support Hospitals in Iraq and Afghanistan and the major military hospital in Germany. They provide care and comfort to those in stateside military and VA facilities and emergency aid to military families in need. They have partnered with the Department of Defense to provide voice-controlled/adaptive laptops to nearly 3,000 severely-wounded servicemembers, as well as other technology that supports rehabilitation. They have provided flights to soldiers on leave or in emergency situations, and to their families wanting to be with them upon their return from overseas. They do so much to help our soldiers and their families. To find out more about Soldiers' Angels or to make a donation on your own, go to www.SoldiersAngels.org. The bracelet measures 8 1/4 inches and will fit a 6 inch (very loosely, but secure) to 6 3/4 inch wrist. If you need the bracelet re-sized, please let me know at time of purchase and this can be done prior to shipment at no additional charge. 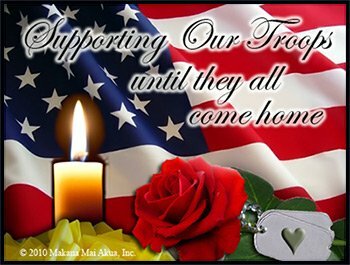 Please Support Our Troops & Remember Our Veterans!! If you are looking for traditional style deployment or soldier bracelets, please see the Support Your Soldier Bracelet™ page.